The odds are that we have the answer! Application History – Where can I see my previous applications? This is a tab at the top of your dashboard. This tab summarises all applications you have made by uploading forms through eTeach or by completing an online school application form. You can open and look at the actual applications that you sent through eTeach by clicking the icon in the column 'Application Details'. Application History - can I edit or delete entries? There is no facility to delete entries on the History tab as it forms a complete audit trail of your applications. If you want to just focus on your most recent ones though, you can sort by ‘Closing Date’ using the little arrows next to the column name. This happens when the method directs the application away from an upload to eTeach e.g. email to the school. In these instances we cannot track your actions so the history will not show fully on the Application history. Don't panic! It is simply that additional uploaded documents won’t show under application history. You cannot amend a CV you have uploaded, so if you want to change it, you will need to upload a new CV. This can be done by clicking the refresh icon next to the CV on your account and then upload a new CV. If you cannot see your new CV, delete your browsing history including cached files prior to signing in again. CVs need to be under 1mb and must be a word document or PDF. Deleting an application - Is there a way to edit or delete an application once its been sent? Once an application has been confirmed, it is immediately available for the school to view so, unfortunately, that application cannot be amended or retrieved. We would suggest speaking with the school directly and explaining the situation. They can then advise where they would like the amended application to be sent. Disclosure and Barring Service - What is a DBS? Email address - How do I change my email address? To change your email address please email candidatesupport@eteach.com from the email address that your account is registered to and include the address you would like it to be changed to. Facebook or LinkedIn registering - will it post to my profile? No! One of the new features we have added is the option to register and then sign in with your Facebook or LinkedIn account. It's purely for your convenience and still totally confidential: there will be no indicator on your social media accounts that you have registered. The eteach.com search works using advanced keyword matching. It then produces a comprehensive set of results – which you can manipulate by filtering. There is a version of this with full screenshots in the FAQs section of the blog here. 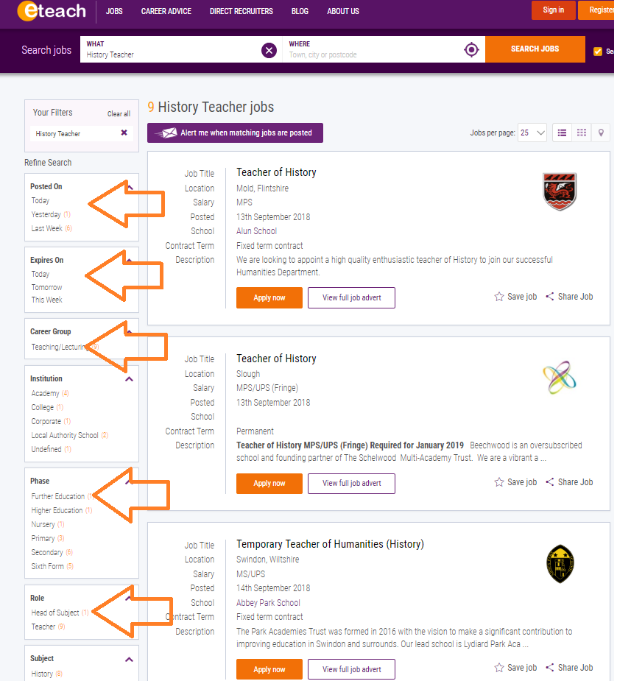 The eteach and FEjobs searches are keyword searches. You can choose whether to search just the advert titles, or the whole advert for the key words you want. There is a version of this with full screenshots in the FAQs section of the blog here. Login - How do I log in? If you are a member, you can log in using your member login details (your email address and password). You should have received an email confirming your details. If you have forgotten your password, follow the password reset process. If you have forgotten your login email address or cannot remember if you are registered with eTeach, just call our Support Team on 0845 226 1906. Login - How do I change my password? Log in using your existing details, which will take you to your "Dashboard". Click on the "Edit profile" orange button and half way down the page there will be an option to change your password. Note - you will need to enter your old password to change it. If you have forgotten your password, follow the password reset process. Store details of job vacancies, which are of interest to you in one click and view similar roles that are also available. 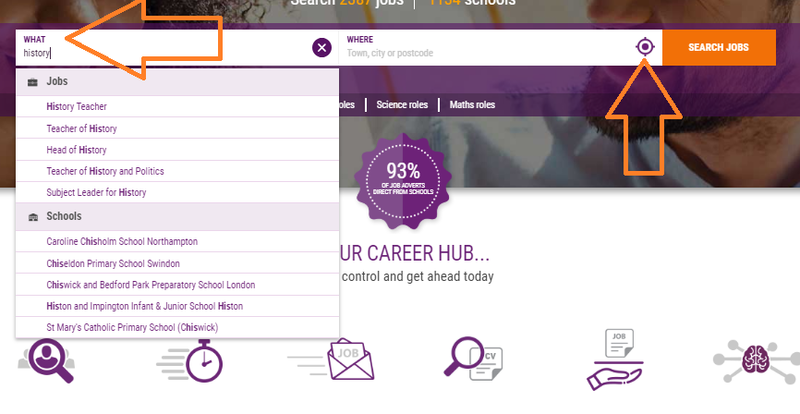 To set up job alerts you will need to complete a search on our site. When the page listing the search results appear there is an option to create job alert/receive emails. Once you have clicked this button an email alert will be set up for you. This will notify you when new roles matching your search criteria have been added. These can be viewed and managed from your account page. To remove alerts, sign in to your account and click the email icon next to the alert you no longer wish to be notified on. This will then appear with a red cross so you can see you are no longer subscribed but can click it again to re-join. 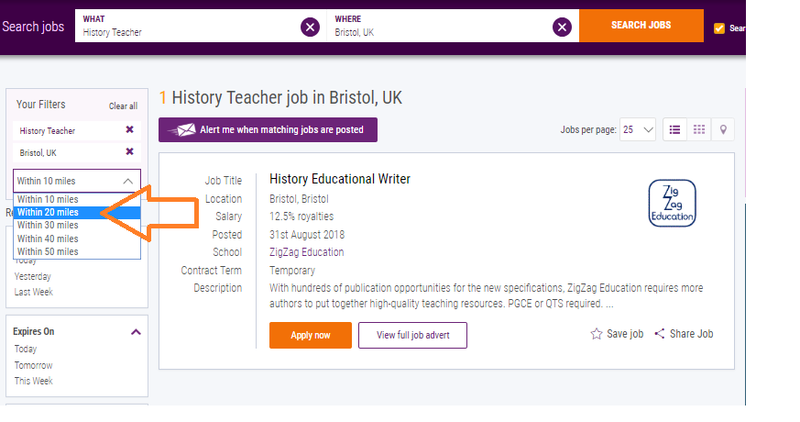 Job search: How to search on eteach.com and fejobs.com? The eteach and FEjobs searches are keyword searches. You can choose whether to search just the advert titles, or the whole advert for the key words you want. Searching with the box ticked will give you a short and targeted set of results of only vacancy pages with your key words in the title. Searching without the box ticked will give you a much wider set of results including every page that has your keyword in the body of the text. Also see "Search: How to perform an advanced search"
Overseas-Trained Teachers - I’m overseas trained – what do I need to be able to teach in the UK? We have lots of information for overseas-trained teachers here. Password - I have typed in my password and email address correctly, why can't I log in? If you are sure you are using the correct password and problems persist, please call our Support Team on 0845 226 1906. Phase changing - If I trained as a secondary school teacher, can I work as a primary school teacher? As long as your certificate provides you with Qualified Teacher Status it isn’t unusual to move from secondary to primary and vice-versa. It is less common to move from primary teaching to secondary teaching because a secondary school teacher must have a subject specialism that they can teach to GCSE. Qualified Teacher Status - What is QTS and how do I get it? Registering - I am trying to register, but keep getting an error message - what could be the problem? If you are getting the message 'This email is already registered on our system', you may have registered with eTeach in the past and your details still exist on the system – either as a recruiter or a candidate. You can use an alternative email address and password to register with or if you want to track down your old login, please call our Support Team on 0845 226 1906. Profile – How do I create my job seeker profile? Your eTeach profile is your key to applying quickly and easily from anywhere. This information can be used to autofill the online application form if schools offer it. If there is a CV uploaded the profile will try to take this to fill the sections. Maintain the relevant information you need to apply online to vacancies. The information in orange on the profile builder is the CV parts that have been pulled across. These can be amended by clicking the ‘pencil’ icon and completing the boxes, or deleted by clicking the ‘bin’. Once it has been confirmed the information will be black. If the profile builder appears to crash, it works best to clear your browsing history before signing in again. Always ensure that your CV is kept up to date too as this is visible to our recruitment team! Profile - How do I change or update my instant online CV? Log in using your existing details. On your ‘My Account’ page you will see your CV below the profile builder. There are two icons next to this. To view your current CV you can click the ‘eye’ to upload a new CV you can click the second icon which looks like a ‘refresh’ symbol. This can happen if you edit your profile builder after you have clicked the online application form. Any changes they make to the profile builder will affect new applications by the online application method but not those in progress or already completed. Privacy - Can anyone see my CV if I add it to the site? If your CV is only present on your profile under ‘my Account’ it will be visible only to our own recruitment teams here at eTeach. If you register your CV to a regional talent pool it can be viewed by any schools in that region unless you have selected to exclude them. If you have joined a school talent pool your CV will be available to view by that school. One of the new features we have added is the option to register and then sign in with your Facebook or LinkedIn account. However this is just an option; you can also register and sign in with your email address as normal. Saving Searches – How do I save searches and create job alerts? Speed up the process of searching for the latest vacancies by creating and saving searches based on your own criteria and receive email alerts informing you of new vacancies matching your criteria. Talent Pools – What are they? You can find out about what they are and how to join here. SEARCH: How do I carry out an advanced job search? The eTeach search works using advanced keyword matching. It then produces a comprehensive set of results – which you can manipulate by filtering. Firstly, type the subject (e.g. history) OR a cluster name (e.g. Harris or Nottingham City Council) or a type of role (e.g. teaching) into the WHAT field. Then, add your preferred location – this will allow you to filter the radius later. The target icon will locate where you are. In the search results page, you can filter using the choices on the left. This works much like the filter you may have seen on shopping or property sites. Talent Pools – How do I join the school and regional Talent Pools? Let schools know that you are looking for work by joining their talent pool and uploading your CV. By joining the regional pool, you will be visible to schools in the region with the option to select schools to not be visible to. Find out more about joining Talent Pools. You can unsubscribe from the emails using the link at the bottom of the email. You can also choose your marketing preferences from within the preference centre which offers a range of options for what type of communications to receive from us.